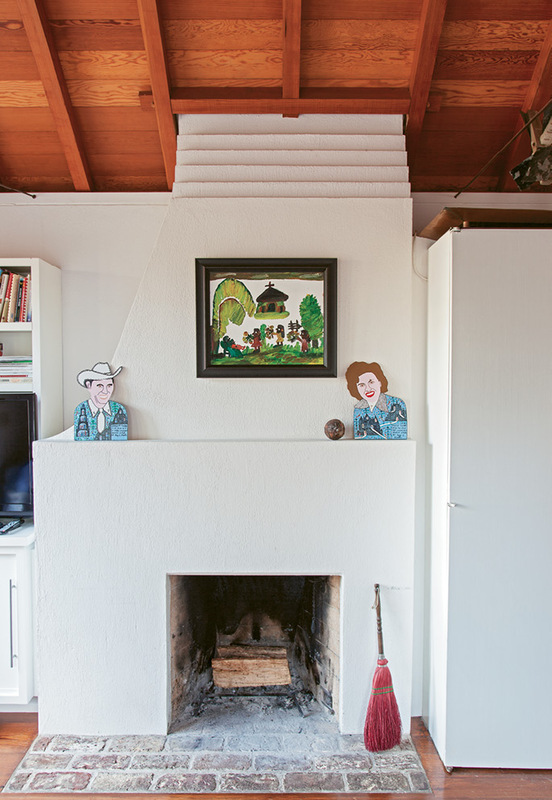 The couple’s folk-art collection could fill a museum. One of Scott’s favorite large-scale paintings presides over the hearth. The handiwork of his friend, the late Purvis Young, it depicts two angels watching over the Overtown neighborhood of Miami, where Young resided. 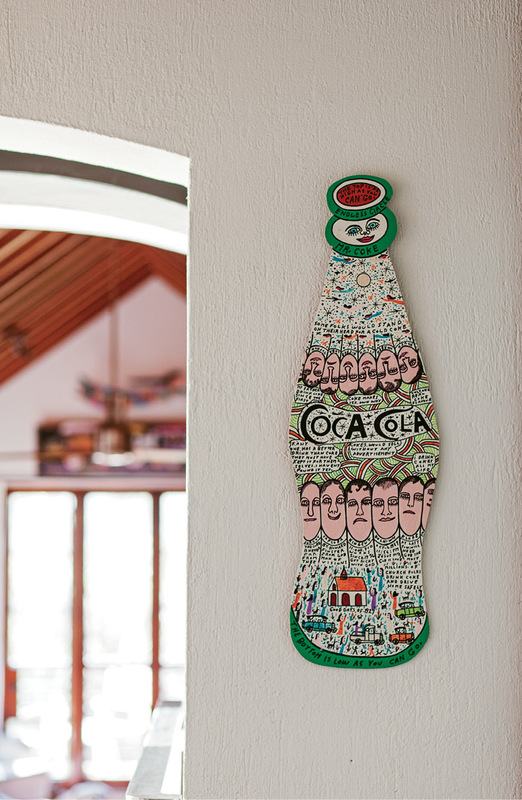 pop art: Mr. Coke (marker and acrylic on wood) by the late Georgia artist Howard Finster; his Elvis at 3 painting on plywood stands near sculptures by Burgess Dulaney of Fulton, Mississippi, on the living room mantel (opposite, bottom right). 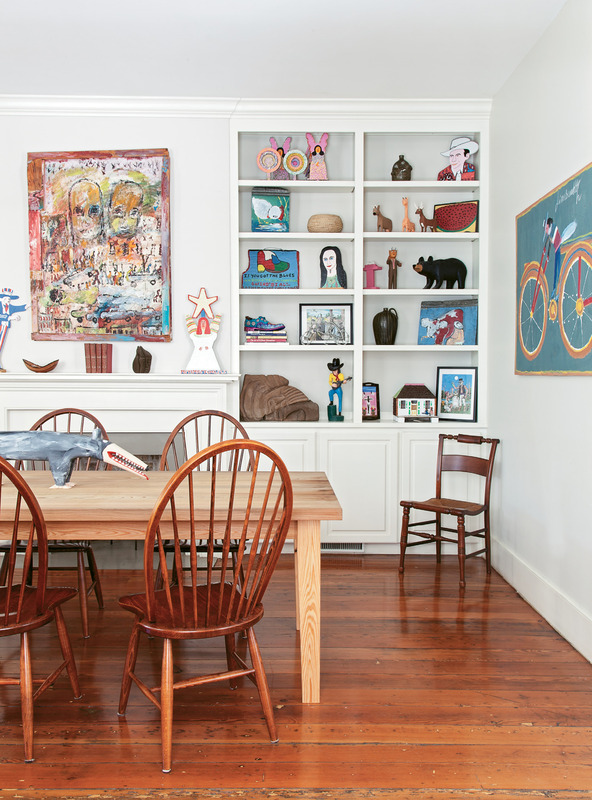 An avid baker, Scott spends a lot of down time here, surrounded by memories of old friends, including Alabama artist Mose Tolliver, whose works flank the arched doorway, and Louisiana’s J.P. Scott, whose carved and painted boats anchor above the cabinets. Two fireplaces cozy things up in the ship-like kitchen; the hearths are historic, but the clean-lined surrounds and mantels feel modern. 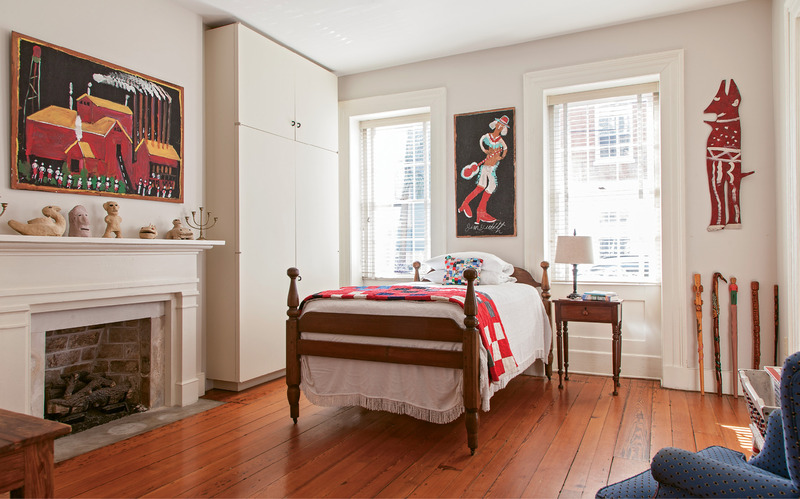 A guest room plays host to several paintings by Jimmy Lee Sudduth, of Alabama, including Sawmill above the fireplace and Musician above the bed. The colorful table was crafted by B. F. Perkins of Alabama. Mississippi artist Sarah Mary Taylor’s Statue of Liberty hand-sewn cotton quilt brightens up a simple wooden desk. 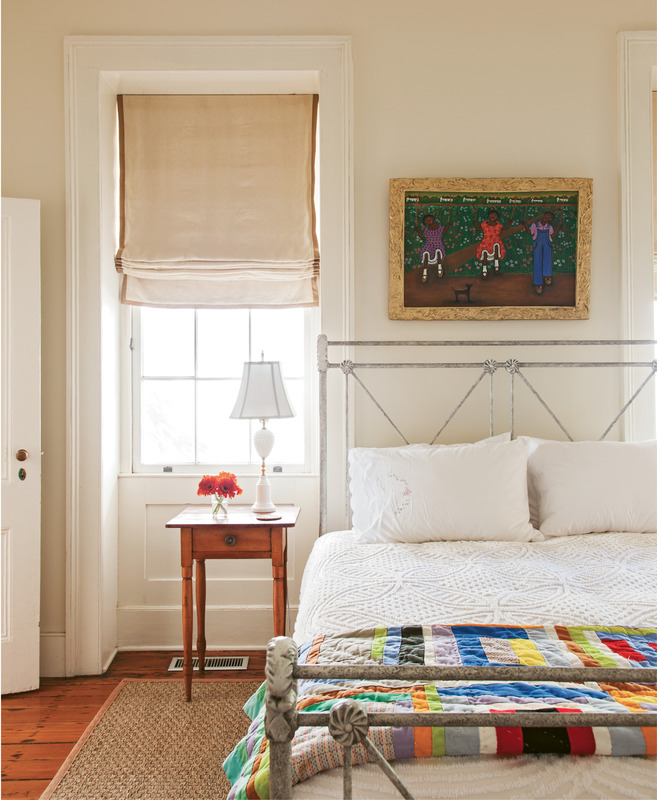 A neutral palette allows the colorful artwork—including a painting by Lorenzo Scott of Atlanta and quilt by Maggie Lou Williams of Bowman, South Carolina—to command visual attention. There’s nothing like the impending arrival of more than 100 guests to inspire some long-delayed nest-feathering. Just ask Scott Blackwell and Ann Marshall. Two years after moving into their saffron-yellow Society Street single house, they were ready to party. 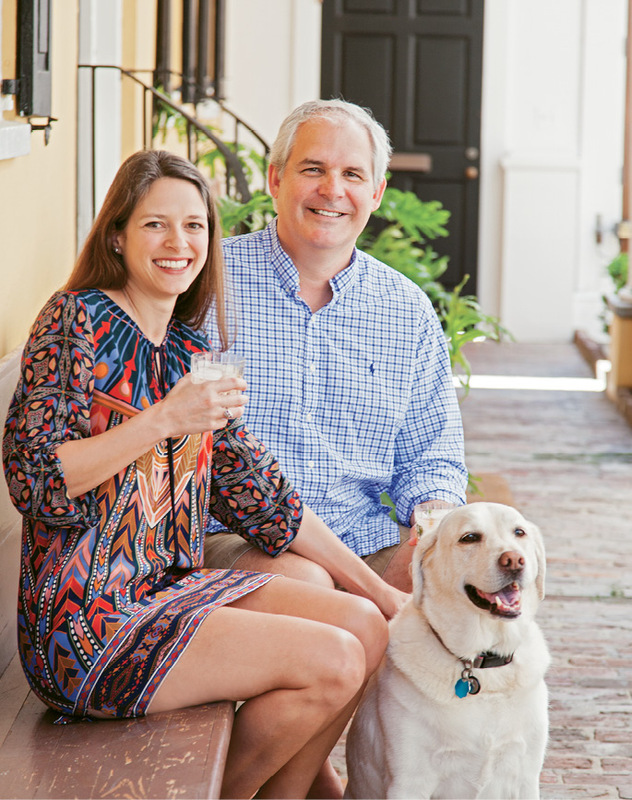 The couple had just wrapped an incredible few years: after selling their North Carolina-based Immaculate Baking Company to General Mills in 2012, they moved to the Holy City in 2013 to launch High Wire Distilling. Since then, the small-batch spirits biz has soared; its artisanal liquors dot the drink menus at local hot spots and garner nods from national publications such as Travel & Leisure. So when a friend suggested the serial entrepreneurs put their three-story stucco manse to good use by co-hosting a shindig coinciding with the 2015 Charleston Wine + Food festival, they happily agreed. With its easy-circulating second-story piano nobile (that’s architecture speak for a view-maximizing elevated recreational floor, in this case, the living and dining zones are connected to an airy kitchen house via a glass bridge), double side piazzas, and a lush courtyard punctuated with a modern bluestone pool, the 3,800-square-foot place was party-ready. Except for one major issue: the walls were totally bare. “We didn’t hang any art for over a year,” Scott admits. It wasn’t for lack of options. 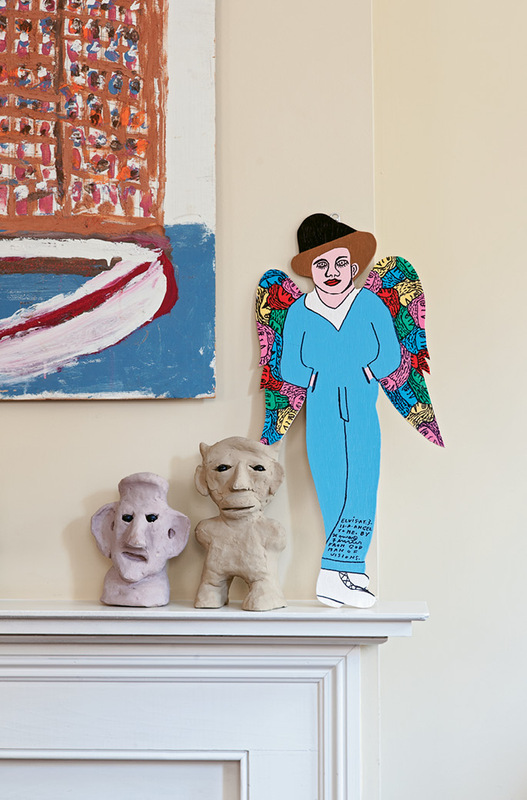 A longtime folk-art collector, Scott owns hundreds of paintings, sculptures, carvings, quilts, and more, all crafted by the untrained rural Southern artists—including Lonnie Holley and Howard Finster—he’s long championed. He’s been collecting these works since his 20s, when he landed a summer job driving a seafood truck up and down the coast. During his travels, he saw Gullah women making quilts and sweetgrass baskets; inspired, he picked up the Encyclopedia of American Folk Art and began road-tripping down two-lane byways throughout the Southeast to find and befriend the makers catalogued in its pages, amassing a veritable museum’s worth of their works. In the past, he’d always been passionate about sharing these pieces with a larger audience. (To that end, he founded the Folk Artist’s Foundation; produced a documentary, All Rendered Truth: Folk Art in the American South, to shed light on the subject; and even incorporated folk art into Immaculate Baking’s branding.) But most of his vast collection was languishing in storage while the duo focused their creative energies elsewhere. With a party on the horizon, though, Scott and Ann were motivated to get to work. 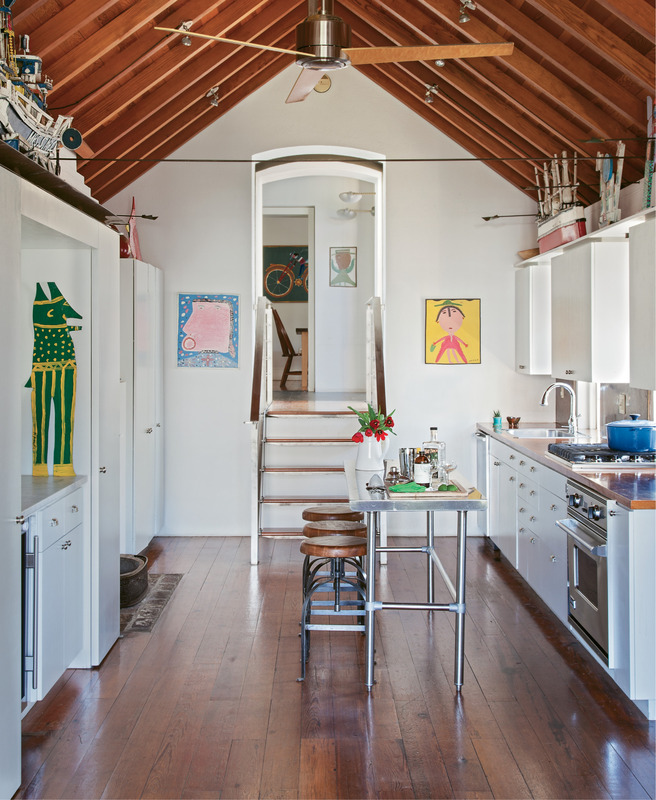 And happily, their abode’s clean lines provided the ideal backdrop for their colorful, homespun art—which is why they were attracted to the property in the first place. Meanwhile, they were staying in the Jervey House, an 18th-century Ansonborough mansion divvied into condos. Their unit overlooked a neighboring historic home that stood out for its use of contemporary materials, including glass, concrete, and slate. From their vantage point, they glimpsed a second-story terrace bordered by a sleek steel railing, and beyond that, surprisingly stripped-down interiors. 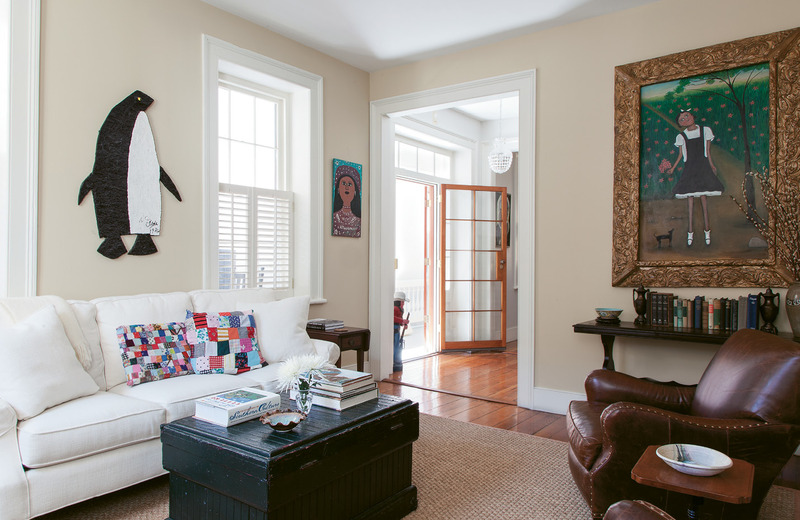 “There were no window treatments, so we could see it was minimalistic and clean inside, too. We’d say, ‘That’s the kind of place we want to be in,’” Ann recalls. It felt like kismet when one day soon after, while cruising the block with their yellow Lab, Sophie, the couple spied a “for sale” sign in front of the very home they’d been admiring. They called their agent and asked to tour the place; walking through its rooms, they were struck by how modern it felt for a structure built in 1854. And indeed, the property has seen several rebirths. The original owner, Juliana Dupré, erected the house within the existing footprint of a building destroyed in the great fire of 1838. More than a century later, in 1961, the residence was refreshed as part of Historic Charleston Foundation’s Ansonborough rehabilitation project. A few decades later, there was need for another major overhaul: “Hugo ripped the roof right off,” Scott says. After the storm, the then-owner streamlined the interiors, preserving the masonry and woodwork but eschewing unnecessary flourish. The results couldn’t be better suited to Scott and Ann, two history buffs. “We’re in the business of looking back on heirloom grains and processes for the distillery, so we like having a house with a story,” notes Scott. On a rare day off, you might find the avid baker in the ship-like kitchen, jamming to Waylon Jennings, turning out blueberry scones and biscuits, and pondering the hands that, almost two centuries ago, may have hoisted the original beams for the vaulted ceiling. A good story is really all that’s needed to spark this couple’s curiosity—and it doesn’t have to be tethered to anything grand or highfalutin. 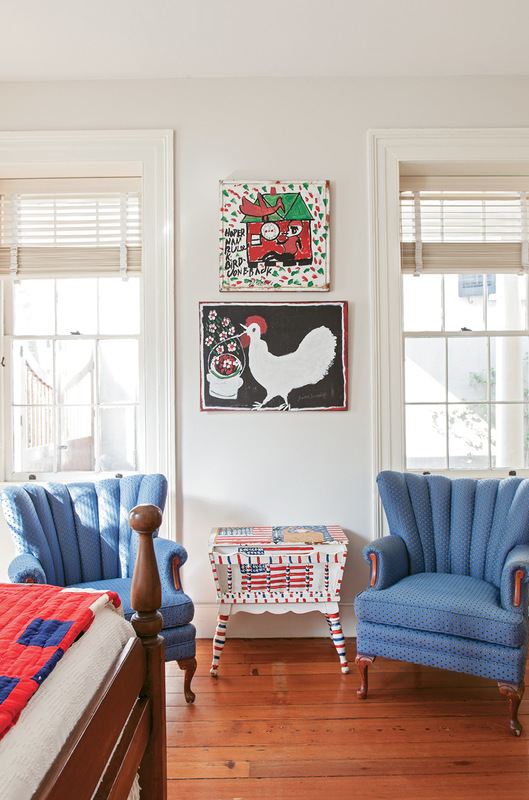 When it came to furnishing their place, for example, the couple pulled from high- and low-end sources to cultivate an old-school Americana aesthetic. 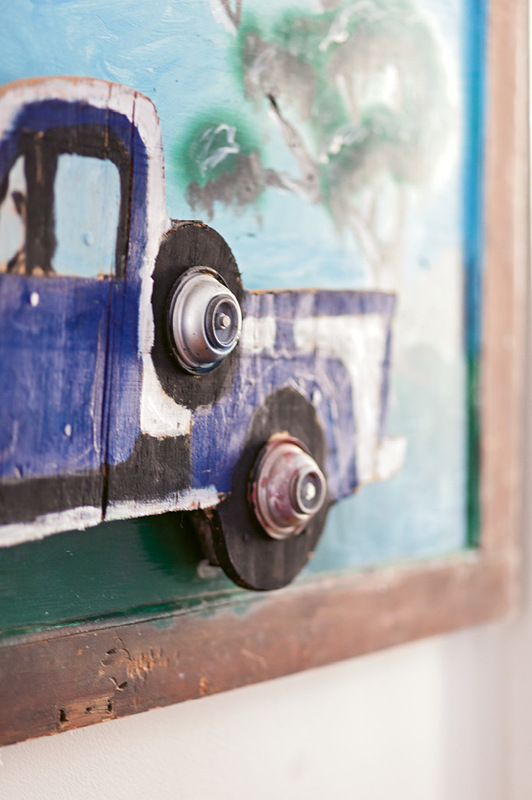 They snagged a few high-quality antiques from various auction houses, but also looked to favorite “junk-tique” stores for lived-in pieces that jive with their rustic art, which is often made from house paint, plywood, tin, and other found materials. 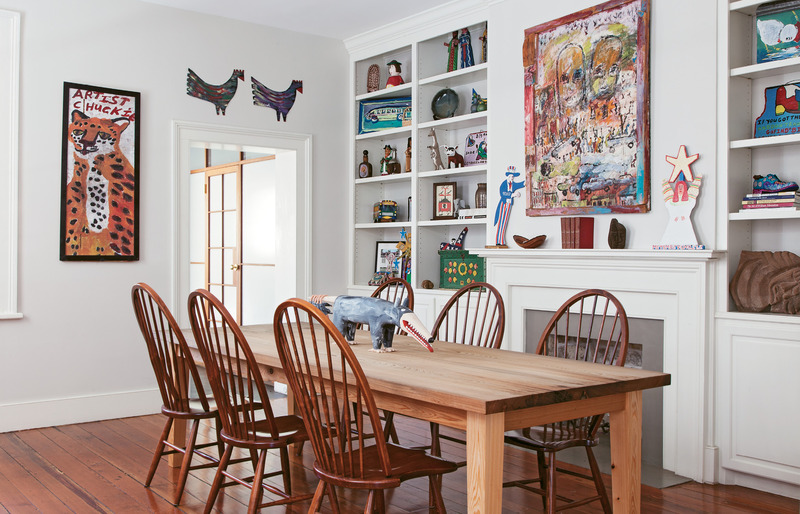 “We love to find the real gems that add a lot of character, the ones with dents and scratches that look like they’ve been around the world a time or two,” Ann says, gesturing to the beadboard trunk that serves as their coffee table.